When your doctor orders blood tests, sometimes they will ask for an electrolyte panelContained in this panel is a test for pH of the blood. Optimal pH of the blood is 7.2. Inherently the body will do everything it can to maintain that pH. This is necessary to run the entire body's biochemical pathways for detoxification, building, and general maintenance. The body has several control mechanisms to keep it at this pH and they include getting rid of excess acid or base by-products through the lungs, saliva and urine. When your body is sick in any way this pH is disrupted. Most times your body is trying to keep up with the extra acid produced. Acids are produced from lack of oxygen, eating an imbalance of protein and carbohydrates and other acid producing foods, and by cell breakdown and production of metabolic waste. Cancer, candida, yeast, mold, fungus, viruses, bacteria and parasites cannot survive in a ph of 7.0 or above. Put a checkmark in each box for the symptoms you are now experiencing. Date the page and keep it for future reference. See how many things have improved after alkalizing for 2-3 months. Measure the pH of your saliva and urine the first thing when you get up. Ingestion of food, liquid, tobacco, or toothpaste can give you a false reading. Litmus or pH paper can be obtained from your naturopath or sometimes a health food store, or email me at info@claremontcoloniccenter.com or call Claremont Colonic Center at (909)603-9200. Cost can vary from .10 per strip to about $14 per roll. pH paper will only give you a rough estimate. The presence of physical signs is a better indication of your alkalinity/acidity. pH paper colors vary by brand. It's important to match the color of the paper you have just touched to your saliva or urine to the picture on the box or color panel of the pH paper. Keep the pH paper in a cool, dark place so the colors on the picture do not fade over time. For the Urine (First elimination only and after eating the foods you would normally eat.) Urine pH tells you how your body handled the food you ate the day before. Ideally you want to check your urine after a minimum of 5 hours of sleep. If your sleep is interrupted, take the reading after the longest sleep and record how long you slept. As you alkalize and your health improves, your sleep will be sounder. You only need one base-line reading for the urine. Here's what the numbers mean. A three-day monitoring period is suggested in Your Health, Your Choice, but for now, we will just do baseline with one reading. Note: The goal is to produce a urinary pH of 6.4-7.0 the first void of the day. Alkaline urine following an acid meal is the result of the body adapting to protect itself. After several years of this it can't do it any longer and then your body really suffers in the form of chronic illness. If the pH is more acid after a meal than before, the pH response was distorted by emotions that affect physiology. Negative emotions give us an acid body. This situation puts extreme strain on the body. Excessive strenuous exercise only increases the acid level. So, do you understand why overweight and sick people don't want to exercise? If the pH stays the same before and after a meal and is in the range of 5.5 - 5.8 then the body is extremely acid and has inadequate reserves. Saliva pH readings should increase after eating a meal. If the reading was 6.8 before eating and 8.0 or higher after the meal this is ideal. If the reading was 6.2 before eating and higher after the meal, this is good and there are mineral reserves available. If the reading was 5.5 before eating and higher after the meal, this is acceptable and there are some reserves available. Notes: If your saliva reading is high after eating a protein and refined carbohydrate meal and low when you eat raw fruits and vegetables, this shows that your alkaline reserve is very low. When you have enough organic sodium (salt from the shaker is inorganic and dead and not useful to your cells), the urine pH registers as an acid after you have eaten acid ash foods. If your sodium reserve is low, your urine pH will register greater than 7.0 after you eat predominantly acid foods. Here is a list of acid producing foods that need to be balanced and decreased from your diet to increase your alkaline reserve. How many of these do you eat regularly? If you "must" have them, cut back on the volume initially. Replace the acid producing foods with foods from the list below. The more alkaline the food is the faster the replacement and replenishment of the alkaline reserve. This is good unless it throws you into what is called a healing crisis in which case, eat more foods from the bottom of the list or from the Neutral column. Note: There are supplements that can assist in this alkalizing process. The best way to determine what to take is to let your naturopath muscle test the products for you. You are the best person to determine what you need if you learn to listen to your body. As naturopaths, that is what we aim to teach you. If you take supplements/drugs/foods that are not making your body strong and healthy the body has to expend extra energy to get rid of the substance putting extra stress on your body and depleting it of the energy it could use towards the healing process. This is very important for the effective treatment of chronic diseases such as cancer. Place all ingredients in the bowl of a blender and blend until smooth. Taste and adjust flavors (salt and or lime) and thickness, you may wish to add more broth. I start out almost everyday with this yummy non-sweet smoothie. This recipe is my variation of a recipe from the kitchen of Shelly Redford Young co-author of The pH Miracle. 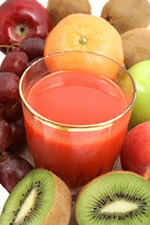 There are many alkalizing recipes included in the book.